Get 3 tones fairer skin, in just 7 days. Instant Whitening provides instant whitening. Sun Protection with SPF 19 PA+++ Protects skin from further darkening by harmful UVA and UVB sun rays. Long Lasting Fairness Fairer skin over time with regular usage. Dermatologically tested suitable for all skin types. 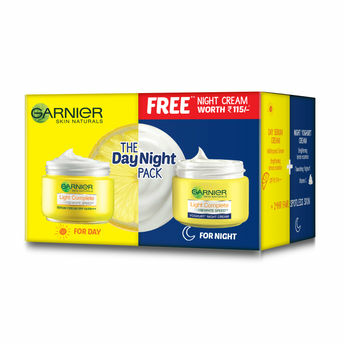 Offer : Free Garnier Light Complete Yoghurt Night Cream 18gm with this product, Hurry offer valid till stock lasts. Explore the entire range of Combos @ Nykaa available on Nykaa. Shop more Garnier products here.You can browse through the complete world of Garnier Combos @ Nykaa .